Act 176, Session Laws of Hawaii 1925, appropriated $45,000 for the acquisition and improvement of an airport and/or landing field on the Island of Oahu. . . within a reasonable distance of Honolulu. The amount was not to be expended until the sum of $20,000 had been raised by private subscription and paid into the Territorial Treasury. The Chamber of Commerce took on the task of raising the money from local businessmen. From these funds an area of 119.3 acres of land and 766 acres under water was acquired from the S. M. Damon estate as an airport site for the sum of $27,410. On August 31, 1925 at 2:55 p.m., Commander John Rodgers and his crew left San Pablo Bay, San Francisco in Navy PN-9 No. 1 to attempt the first flight across the Pacific Ocean from the Mainland U.S. to Hawaii. The plane was forced to land in the ocean at 4:15 p.m. September 1 after running out of fuel about 365 miles from Oahu. John Rodgers Airport was dedicated March 21, 1927. The principal speaker at the dedication was the Honorable E. P. Warner, Assistant Secretary of the Navy. The field was named in honor of the late Commander John Rodgers, who had been Commanding Officer of the Naval Air Station at Pearl Harbor from 1923 to 1925, when he left to command the Navy’s historical flight between the West Coast and Hawaii. Act 257, Session Laws of Hawaii 1927, approved May 2, 1927, by Governor Wallace R. Farrington appropriated $75,000 for airport development at John Rodgers Airport. The labor of clearing and grading the 119.3 acres of the airport was progressing slowly but surely under appropriations of the 1925 and 1927 Territorial Legislature. 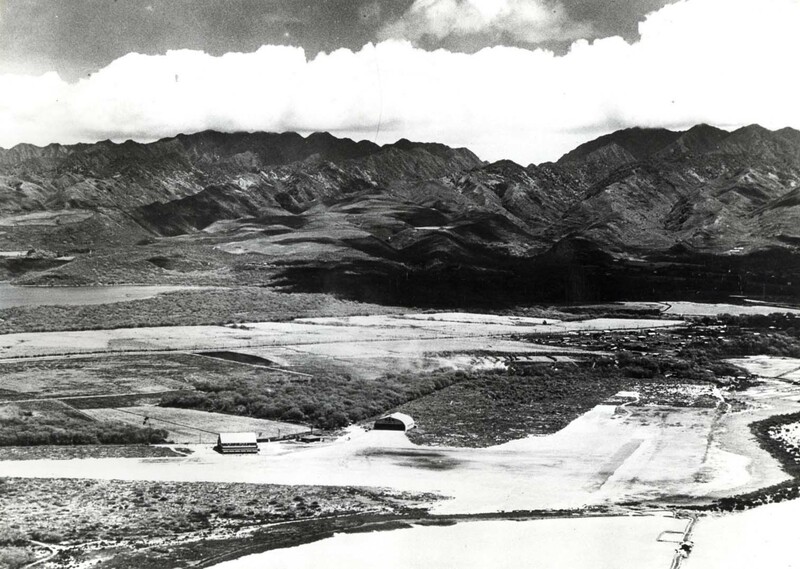 John Rodgers Airport comprising 885 acres and located at Keehi Lagoon was placed under the jurisdiction of the Territorial Aeronautical Commission by Executive Order 293, dated August 2, 1927. A portion of John Rodgers Airport was under construction in 1929 by the Superintendent of Public Works. A runway 250-300 feet wide and 2,050 feet long was completed as well as considerable clearing on the balance of the area. Some 766 acres of the airport was under tide water. The balance of 119 acres was available for clearing and grading. There was much delay in getting the airport prepared for use. The delay was blamed on problems of divided responsibility and a lack of sufficient funds. The Territorial Aeronautics Commission noted the following improvements were needed immediately: clearing, grading, filling, roadways, runways, landing strips, aprons, water service, hangars, administration building, telephone, electric light and power service, and fencing. 1929 witnessed the inauguration of commercial aviation in Hawaii on a larger scale than any previous such period. Several new concerns were organized and incorporated to conduct flying activities within the Territory. Among these were Hawaiian Aeronautical Industries at John Rodgers Airport, with W. D. Cannon, Chief Pilot. Hawaiian Aeronautical Industries, Ltd., incorporated November 5, 1928 with authorized capital stock of $1,050,500. They intended to conduct regularly scheduled interisland passenger and express transactions. They were awaiting two Fokker F-10 Super-Trimotor planes which would carry 12 passengers, baggage and freight. They offered pilot and mechanic instruction, and general flying activities such as sightseeing and aerial photography. They had three land biplanes–an American Eagle, a Swallow and a JN-4. Eventually they did get started, flying a Kreutzer plane. 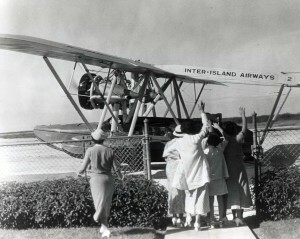 Inter-Island Airways incorporated on January 30, 1929, with an authorized capital stock of $2 million. 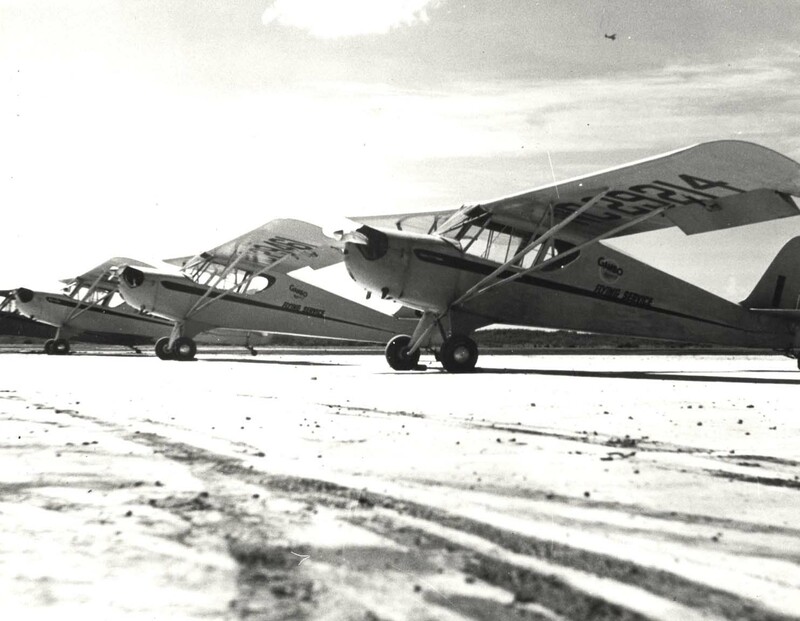 On October 29, 1929, two Inter-Island Airways S-38 amphibians made pre-inaugural flights from Honolulu to Hilo, piloted by Lt. Cover and Captain Charles I. Elliott. Each passenger was allowed 20 pounds of baggage, 25-cents per pound for baggage in excess of 20 pounds. During the first year of operations Inter-Island flew a total of 275,574 miles and carried 10, 355 passengers; and 18,680 pounds of express. 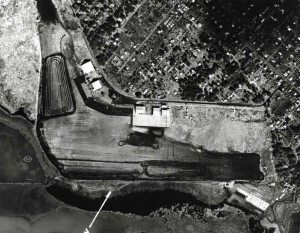 A 1930 aerial photo of Rodgers Airport shows two runways and two hangars. One of the hangars is marked Inter-Island Airways. During the years 1930-1931, 40,000 cubic yards of coral was placed to grade and surface additional areas for the runway. The cross-wind runway was widened from 100 feet to 250 feet and lengthened from 1,600 feet to 2,050 feet. The main runway was widened from 250 feet to 550 feet and lengthened from 1,800 feet to 2,200 feet. One thousand feet at the windward end of the main runway was brought to rough grade and needed only surfacing coral to complete a runway a total length of 3,000 feet. The intersection of the two runways was increased and brought to a finished surface. This added greatly to the appearance and usefulness of the airport. Eight hundred feet of wire fence was placed across the space between the two Inter-Island Airways hangars so that the public was effectively kept off the runways. The macadam take-off strip was resurfaced during the year with a surface coating of bitumuls and fine rock. Of the 40,000 cubic yards of coral placed, 10,000 cubic yards were from Ala Moana and loose coral collected from outcroppings in the airport; 30,000 cubic yards was quarried from one corner of the property; 22,500 cubic yards was excavated by contract and 7,500 by prison labor. The prisoners did good work during the year and were depended upon for the further development of John Rodgers Airport as no funds were available to undertake further contracts. It was proposed to add to the width and length of the cross-wind take-off, cut off certain angles between intersections to increase the usable area, and complete widening of the main take-off though the placing of approximately 20,000 additional yards of coral. An attempt was made to obtain this coral from dredging operations in progress at Pearl Harbor. A sum of $24,000 was spent on clearing and grading. Water and electricity were provided for $3,481. Interisland Airways Ltd. and Hawaiian Airways Co., Ltd. were given permission to erect hangars with 20 year leases. An additional building was erected for $5,609. From 1932 to 1937 the Works Progress Administration lengthened Rodgers Airports’ runways, at a cost of $34,000. In 1932 Andrew Flying Service inaugurated non-scheduled flights from John Rodgers Airport to airports on the Neighbor Islands, as well as the smaller airports that could not be served by the scheduled airlines. One principal service of this -carrier was to Kalaupapa Leper Settlement. In 1933-1934 a gang of prisoners worked steadily at John Rodgers Airport cutting brush and weeds, blasting and grading coral, and keeping the runways in good shape. With the development of air travel, development of suitable public airports was an increasing necessity in 1934-1935. Additional federal grants were needed to improve and enlarge the airport. Some funds were available to maintain the field, but with prison labor and FERA assistance, considerable improvements were made. 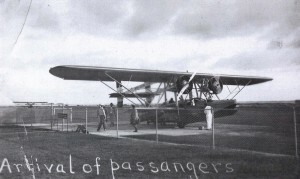 Inter-Island Airways, Ltd. used all of the Territorial airfields and five of them, including John Rodgers, on a regular daily schedule with passengers and mail. A rental charge was instituted in 1935 for building areas occupied by them. John Rodgers Airport had a coral-filled area with a paved runway for the prevailing wind. 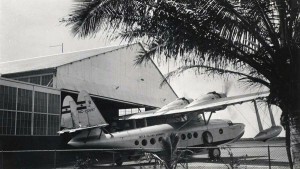 The field housed the main shops of Inter-Island Airways, Ltd., and was patronized extensively by amateur fliers. The Territorial airport custodian was housed at this field, and two hangars housed the planes used by private fliers and two aviation schools. A concession was rented by the Territory for lunches and soft drinks. The principal needs at the field were clearing and grading and additional paving. Prisoners continued to maintain the field. Buildings were rearranged on the eastern side so that future hangars could be built along the field and a roadway developed in the rear. 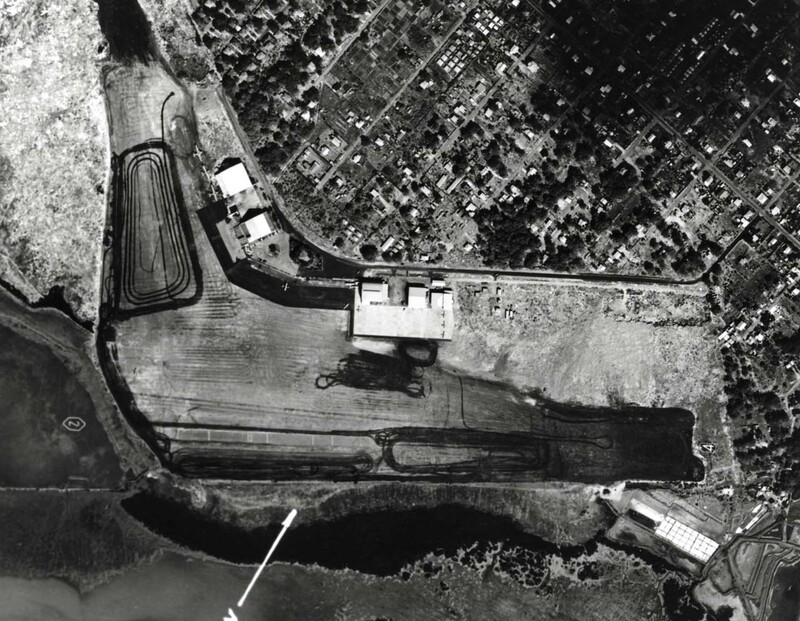 In December 1935 planning was initiated for seaplane runways in Keehi Lagoon adjacent to John Rodgers Airport. The Department of Public Works requested the Commissioner of Public Lands to procure 66.22 acres of land to enlarge John Rodgers Airport in 1936. The land acquisition provided two runways, 4,000 and 3,500 feet long. The runways were paved 300 feet wide with 100 feet of grading on each side. Considerable work was done by the Work Progress Administration (WPA) in the extension of the runways at a cost of $8,733.14 for materials, $24,973.33 for labor for a total of $33,706.47. The Territory applied for 100,000 gallons of crude oil from Pearl Harbor to lay on the runways to reduce the dust. No further construction was contemplated at Rodgers Airport until the location of a Seaplane basin could be decided upon. Dredgings from the basin, if located near John Rodgers Airport, could be used for the improvement of the field. In 1938 the Chief Inspector of the Bureau of Air Commerce, USDC rated John Rodgers Airport as the worst in the islands. During the fiscal year 1938-1939, $1,076 was spent at John Rodgers Airport. No construction was undertaken on the field awaiting approval of the Keehi Lagoon Seaplane Basin Project. The U.S. District Engineer report on the seaplane runway was approved by the Chief Engineer U.S. Army and forwarded to Congress for funding. In 1938 Marguerite Gambo opened a flying school at John Rodgers Airport and built a hangar adjacent to the Inter-Island Airways hangar. The K-T Flying Service also began operating from John Rodgers Airport. A total of $609.92 was spent on improvements at John Rodgers Airport during the year 1939-1940. At the request of the Army and Navy, land on Kauai, Maui, Hawaii and Molokai was set aside for military use. 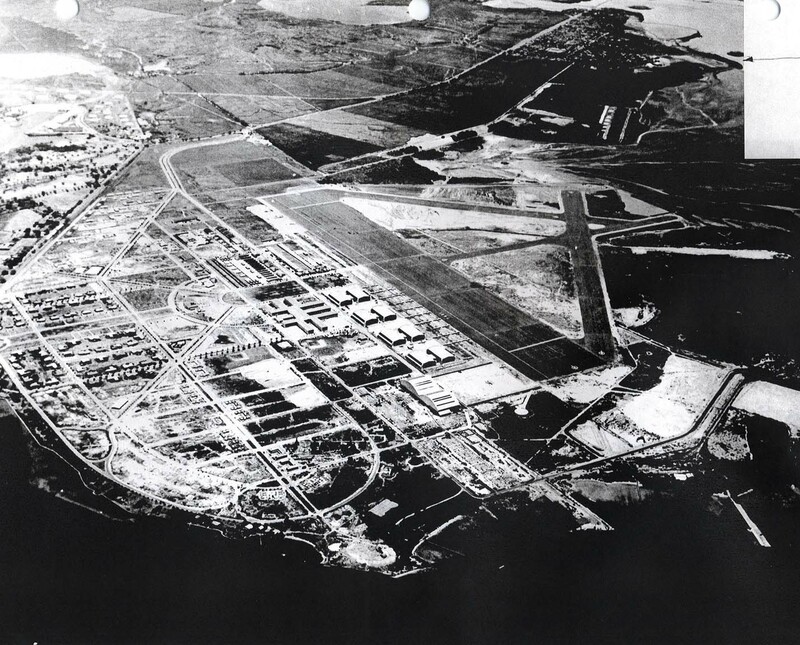 In exchange, the U.S. Army turned over 91.133 acres at Hickam Field for future development of John Rodgers Airport. Since the inception of John Rodgers Airport a total of $355,945.44 was s pent on construction and maintenance. This included $51,300.54 in Federal funds; $191,237.59 in Territorial funds, and $113,407.31 from Inter-Island Airways. The total rentals received from Inter-Island Airways, Ltd. and private flying services at John Rodgers Airport amounted to $2,720.70. In 1936, Governor Poindexter requested the U.S. Department of Air Commerce to send an engineer to Hawaii to advise the Territory in its airport program. Robert I. Campbell was assigned by the department for this work. In 1939, Campbell returned to Hawaii at the request of Governor Poindexter to work with the U.S. 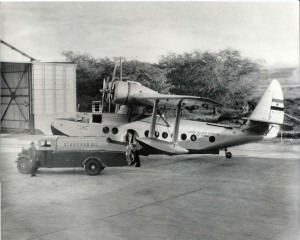 Engineers in connection with the design and construction of the Keehi Lagoon seaplane project. A Federal appropriation of $9 million was authorized for development of this and other Territorial airports. In 1940, Congress authorized a total of $3.3 million for dredging of Keehi Lagoon. In 1941, an additional sum of $1.9 million was authorized for the development of John Rodgers Airport in conjunction with the seaplane project. 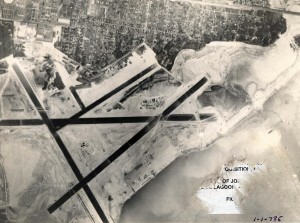 Layout for this combined airport and Seadrome as submitted by Campbell in July, 1941, was carried out by the U .S. 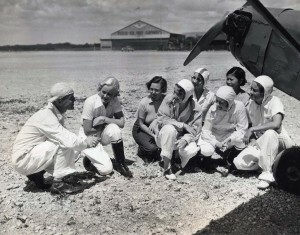 Engineers and the Navy in the war development of John Rodgers Airport. In 1940 final approval of the Keehi Lagoon Seaplane basin was given by the Chief of Engineers, U.S. Army and a contract for the dredging in the amount of $3.3 million was awarded to Standard Dredging Company, Los Angeles, California. A change in one of the runways was being considered, which would increase the cost by $500,000. Construction began in October 1941. Work by the Survey Division of the Territorial Highway Department was necessary on this project as the rights-of-way involved 1,621 different ownerships. In this connection, the Department of Public Works applied to the Civil Aeronautics Authority for funds to initiate a survey to determine the feasibility of building land runways at the same time the seaplane runways were being dredged, as well as developing a final plan for a complete airport. The Hawaiian Department, the U.S. Engineer and the local Civil Aeronautics Authority office approved the request and it appeared probable that such funds would be allotted. Immediately on completion of the survey, the Territory applied to the CAA for the necessary funds to construct the airport. During the year, the CAA spent $53,000 on John Rodgers Airport, while the U.S. Engineer spent $3.3 million on the Keehi Lagoon Seaplane Basin. The Territory collected $18,076.08 in aviation gasoline tax, which amount was expended in maintenance and operation of the airport. The Civil Aeronautics Administration completed a radio station at John Rodgers Airport in 1940. On July 1, 1940 there were 28 private planes registered in the Territory. On July 1, 1941, there were 43 private planes registered, an increase of 54 percent. These planes were all operated commercially either by the established operators or were owned by flying clubs. Three new clubs were organized within the year. A total of 18,950 hours were flown by these airplanes. Of this total, 17,085 hours were logged by planes operating at John Rodgers Airport. All of this flying, which consisted mostly of student instruction and solo flying, was done without injury. A few landing and taxiing accidents occurred during the year, but all were minor and no injures were incurred by personnel. Four of these accidents were caused by high winds upsetting light aircraft while taxiing. There was an increase of approximately 100 percent in flying activities at John Rodgers Airport during the 1940. On Sunday, November 10, 1940, 517 take-offs were made. On Sunday, June 29, 1941, 720 take-offs were made. Each takeoff represented a landing; therefore, on an average weekend or holiday there were approximately 1,400 landings or take offs. A conservative estimate would indicate a 50 percent increase in flying in the next six months. A control tower was urgently needed at the airport. The flying services operating at John Rodgers Airport made substantial improvements to their planes and facilities during the year. The Andrew Flying Serving built an extension to its hangar for an office. The K-T Flying Service built a new all-steel hangar 90 by 100 feet. Standard Oil Company installed an additional gasoline service, consisting of a 1,000-gallon underground tank and service pit at the K-T hangar. Gambo Flying Service erected a 40 x 60 foot hangar and extended it to 60 x 80 feet to provide for two classrooms and two offices. On October 1, 1941, Inter-Island Airways changed its name to Hawaiian Airlines. 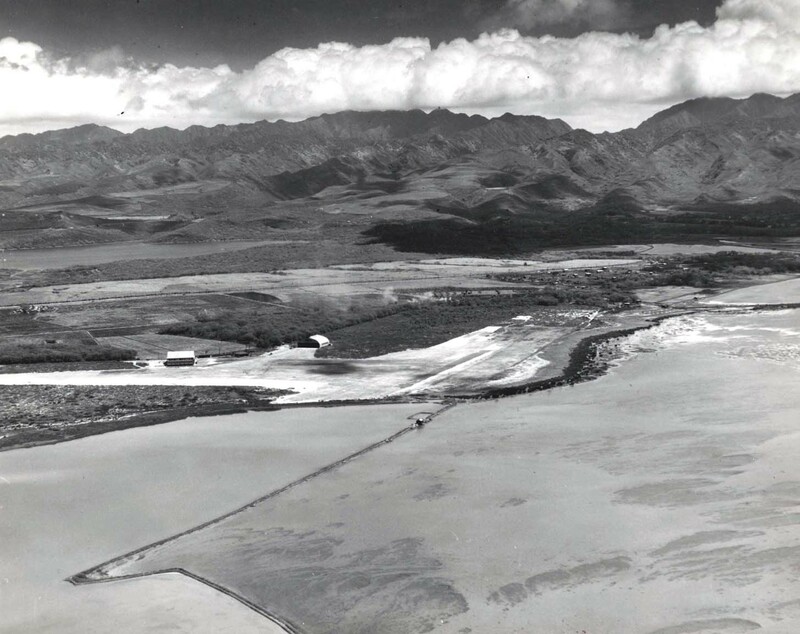 In October 1941, layout was complete and the Army Corps of Engineers began dredging Keehi Lagoon for seaplane runways, using the spoil to augment John Rodgers Airport. $5 million was appropriated by Congress for the project. On November 27, 1941, the Hawaiian Islands were placed on alert. Attack by Japanese Forces was expected in the Philippines. Additional security measures were taken but aircraft were bunched up to protect against anticipated sabotage rather than dispersed against potential air attack. At 0755 on Sunday morning, December 7, 1941, 183 aircraft from six Japanese aircraft carriers struck American military facilities and vessels on Oahu. The second wave consisted of 170 aircraft. Ninety-four American ships were in Pearl Harbor which is located less than two miles from John Rodgers Field. Four hundred American aircraft were parked at Ford Island, Hickam Field, Wheeler Field, Ewa MCAS, Kaneohe MCAS, Bellows Station and Haleiwa Field. The Japanese attack sunk 18 American ships and destroyed 188 American aircraft and caused 2,335 American military deaths while losing 29 Japanese planes, damaging 50 Japanese planes and suffering fewer than 100 Japanese deaths. 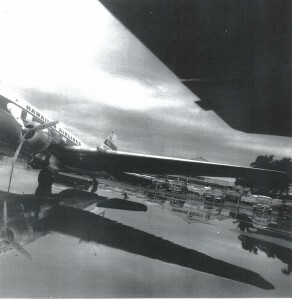 A flight of 11 B-17s arrived during the attack from the West Coast and landed at Wheeler, Haleiwa, Hickam and the golf course at Kahuku. One plane was destroyed and three badly damaged. Two Hawaiian Airlines transports were damaged on the ground at John Rodgers Airport during the attack on Pearl Harbor. The first civilian casualty of the war in Hawaii was Robert Tyce, owner of the K-T Flying Service, who was killed by machine gun fire from Japanese torpedo planes as they flew over John Rodgers Airport on their way to Pearl Harbor. Small planes of other flying services received bullet holes but were able to return to Rodgers Airport without injury to pilots or passengers. Gambo Flying Service lost two planes and two civilian Aeronca aircraft were fired on by the attacking forces. World War Two had started in Hawaii and was followed within a few hours by attacks on the Philippines and the Dutch East Indies. Immediately after the Pearl Harbor attack all airports were taken over by the armed forces of the United States. Some of these airfields were considered vulnerable to attack and unusable, and the others were placed under strict control of either the Army or Navy. All civilian aircraft in Hawaii were grounded. Within a few days, Hawaiian Air was approved by the Military Governor to make emergency flights under military direction, carrying engineers, medicines, munitions, etc. to the neighbor islands. Passenger priority supervision was exercised by the Army for security purposes and expediting war priority transportation. As a security measure, airplane windows were blacked out. An “Agreement with the United States Relative to Operation and Maintenance of the John Rodgers Airport and Keehi Lagoon Seaplane Base” was reached between the Territory and the military. Kalaupapa Leper Settlement on Molokai was isolated and the Gambo Flying Service based at John Rodgers Airport was authorized by the military to furnish emergency transportation of medical supplies, etc. direct to Kalaupapa. These flights were made by Marguerite Gambo with a Fairchild monoplane which was suitable for operation into the small field at Kalaupapa. 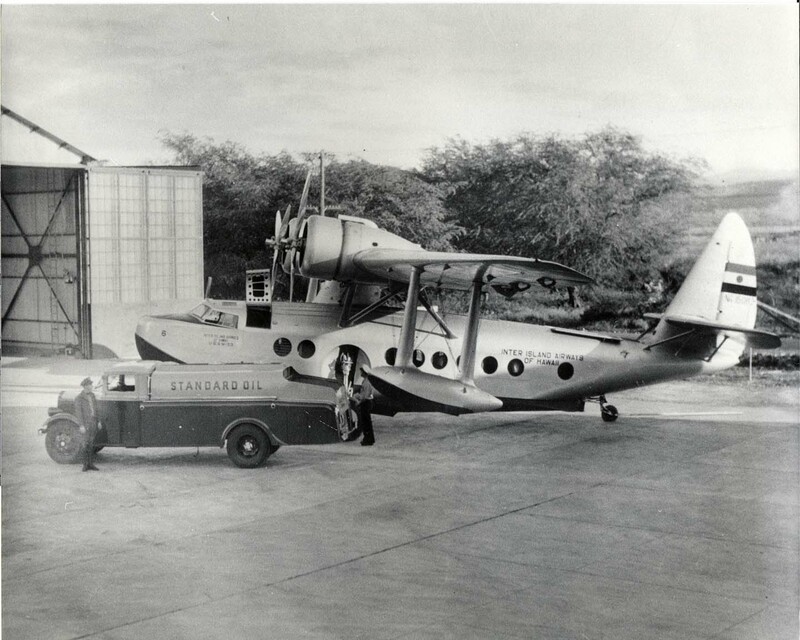 During the early days of the War, Hawaiian’s Sikorsky planes were converted to cargo planes, carrying critical medical supplies and equipment to the other islands and bringing back cargo of fresh vegetables and beef. Thus began the first U.S. air-freight service. 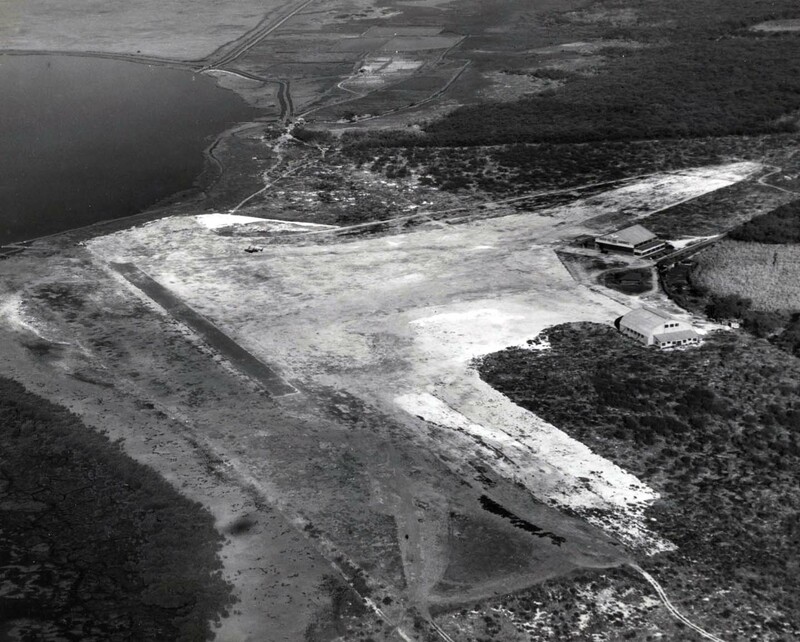 In December 1941 the Army Corps of Engineers was about 10 percent complete on the dredging of three seaplane runways at Keehi Lagoon which were to be two to three miles long by 1,000 feet wide by 10 feet deep. Dredging was intensified with as many as nine dredges working on the project which was useable by late 1943 and completed in September of 1944. More than 10 million cubic yards of coral was placed between John Rodgers Airport and Hickam Field, in Fort Shafter Flats, in Mapunapuna and elsewhere in the vicinity. However, the most important construction was four runways at John Rodgers Airport which would become Naval Air Station Honolulu (NAS 29) and home base for an Army and Navy Air Transport Command. Immediately after December 7, 1941, the control and operation of all Territorial airports was taken over by the armed forces for the duration of the war and six months thereafter. Under these conditions extensive improvements were made at John Rodgers Airport. Upon the outbreak of war all civilian flying was suspended with commercial airlines allowed to continue some operations on a restricted basis. Flying around the islands during the years 1941-45 was risky. There were 37 crashes, seven of them civilian and 485 lives were lost. Dredging operations on the Keehi Lagoon seaplane base commenced in October 1941. Dredged material from these operations proved to be of great benefit to the war effort. More than 10 million cubic yards of coral were dredged by six cutterhead and hopper dredges and the material was deposited from Fort Kamehameha to Mapunapuna to Fort Shafter Flats and Sand Island. 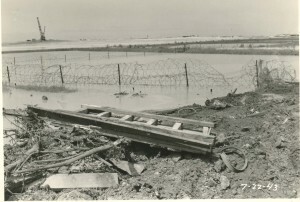 The elevation of the airport was continued at about eight feet above low water. The amount of land at John Rodgers Airport increased from about 200 acres to more than 1,000 acres. 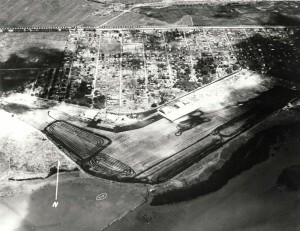 A square mile of area between Hickam Field and John Rodgers Field was also filled in and a future joint runway conceived. By mid 1943, the land plane area had been filled by spoil from seaplane channel dredging and three runways completed. The three seaplane runways were more than two miles in length and 9 to 10 feet deep. 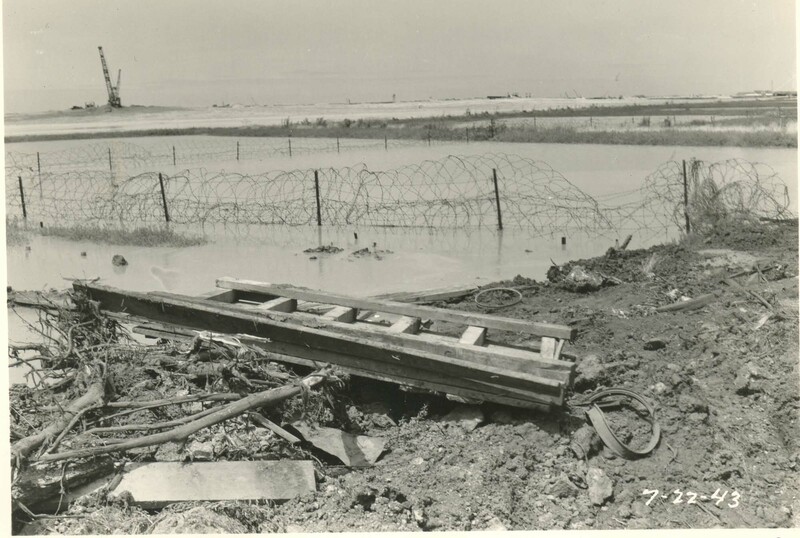 The field was taken over by the Army at the beginning of the War and used as a troop carrier transport base while construction of the runways was in progress. In August 1943, the Navy received a permit from the Territory to enter and construct facilities for its own use. Extensive construction was undertaken to provide a base for seaplane and land plane operations, principally for the Naval Air Transport Service. The airport was officially designated as Naval Air Station Honolulu. 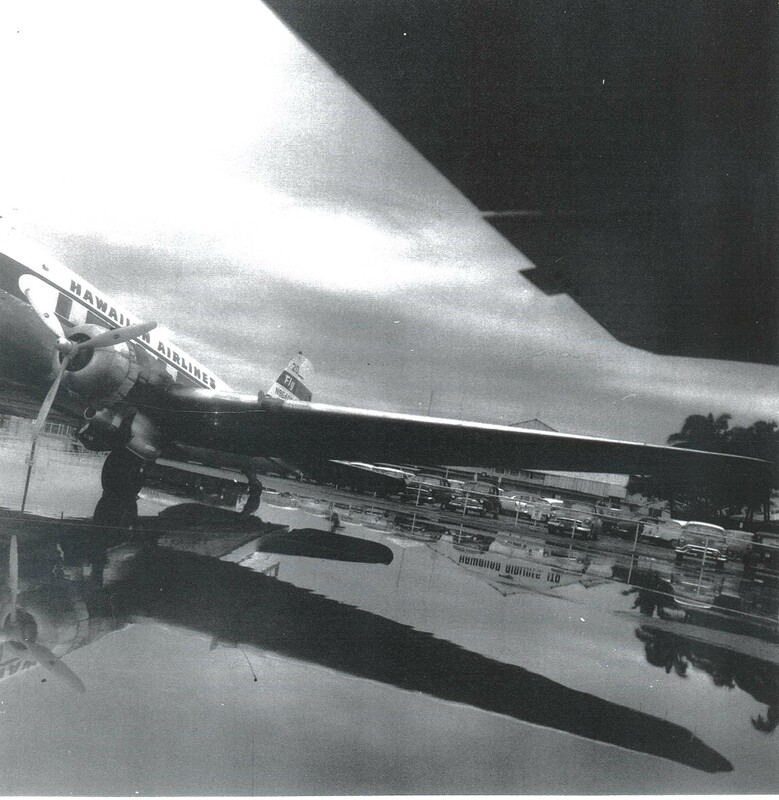 The Army continued to use the field in conjunction with the Navy and all B-29s and many other combat planes were staged through the airport, making it one of the most important installations in the war. The establishment of Naval Air Station, Keehi Lagoon, was approved by the Secretary of the Navy. The station was to serve as a terminal for NATS and Pan American Airways. The initial operation of both land and sea planes was planned for December 1, 1943. On December 26, 1943 the Secretary of the Navy redesignated the Naval Air Station, Keehi Lagoon as U.S. Naval Air Station, Honolulu, Territory of Hawaii, with the primary mission of maintaining and operating a base for Naval Air Transport Units, Pacific Wing. During the war years, John Rodgers Airport was also home base for the Naval Utility Flight Unit, Naval Air Transport Service, 1522d AAF Base Unit, 15th Air Service Squadron and 19th Troop Carrier Squadron. Naval Air Station Honolulu (NAS 29) was operational in late 1943 but was commissioned on January 1, 1944. The Navy completed construction of a terminal building, control tower and maintenance hangars for land planes operated by the Naval Air Transport Services. On the north side of the field, the Navy built the Naval Air Station Honolulu to support the Naval Air Transport operations and to house about 5,000 men. Full scale operation commenced at U.S. Naval Air Station Honolulu for both land and sea planes on April 1, 1944. On November 1, 1945, at the conclusion of World War II, the ban was lifted on private flying and airfields were opened to civilians. Additional land was acquired for Keehi Lagoon at a cost of $40,334.97 in 1946. The Territory let one contract for paving at the airport for $7, 668.96. Most of the maintenance of the airport was handled by the military agencies occupying the airport. Plans were underway for the return of John Rodgers Airport to the Territory from the U.S. Navy. Personnel were being recruited to handle the many duties which would be involved. Location and archeological studies were made at the Keehi Lagoon Seaplane Harbor and John Rodgers Airport at a cost of $100,000 with funds appropriated by the 1945 Legislature. In 1946, John Rodgers Airport was one of the largest airports in the United States and comprised a total area of 4,019.476 acres. It had four paved land plane runways, 200 feet wide and with lengths varying from 6,200 linear feet for the shortest one to 7,650 linear feet for the longest one. There were three seaplane runways, each 1,000 feet wide with an average length of approximately 2.7 miles. The seaplane runways were used only by the Navy, which had about five flights per week with Mars seaplanes between Honolulu and California. Due to the tremendous advances in air transportation during the War, there was an unprecedented urge to “get on the bandwagon” of the new air age after the war. Veterans were encouraged by their priority in obtaining surplus aviation equipment. In addition, space for federal agencies had to be provided. These included the CAA Control Tower, Airways Traffic Control and Communication Center. Also U.S. Customs, U.S. Immigration, U.S. Department of Agriculture, U.S. Public Heath and U.S. Weather Bureau. G-I flight training under the government vocational training program for veterans was the main source of revenue for flight schools with G-I contracts. This federal expenditure was a great help to the struggling private flying industry. John Rodgers Airport was returned to the Territory on October 1, 1946. During the nine months of the fiscal year, a total of 44,938 landings were made. In October 1946, the Navy turned over two small crash-fire trucks and a 500 GPM pumper to the airport. This marked the origin of an airport emergency service that was soon comparable to the best at mainland airports.